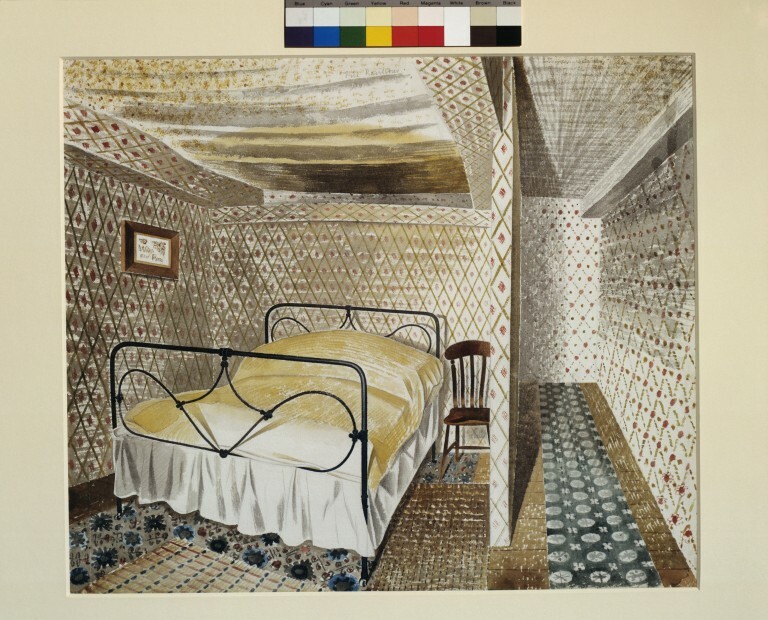 Eric William Ravilious (1903 – 1942) was an English painter, designer, book illustrator and wood engraver. He grew up in East Sussex, and at the Royal College of Art (1922–5) was taught by Paul Nash and became close friends with Edward Bawden. In 1939 he officially served as a war artist, and died when the aircraft he was in was lost off Iceland. He is particularly known for his watercolours of the South Downs, empty rooms and war paintings. His use of watercolour and limited muted palette to capture light, often overlaid by crayon lines, has a beautiful shimmering quality. He uses exaggerated perspectives, unusual viewpoints and abstract shapes to create drama, suspense and movement. The effect is often haunting – reflecting a mix of nostalgia and foreboding in the world destroyed by the war. CONSTABLE, F. & SIMON, S. 2003. The England of Eric Ravillious, Surrey, UK, Lund Humphrey. His use of two point perspective – slightly off – creates a feeling of claustrophobia, uncertainty and unease. The eye goes first towards the bed, strangely reflected in the ceiling of a windowless room. But then is taken down the empty corridor that appears to go upwards to nowhere and round a corner to the light. Is this an escape? Or a dead-end to nowhere? Or worse?